● Kevin Harvick started second and finished 11th. ● The Jimmy John’s 9-Grain Wheat Sub driver came to pit road under green-flag conditions on lap 10 for four tires and fuel, but the team received a penalty for an uncontrolled tire. ● The No. 4 Ford returned to pit road under caution on lap 12 for fuel and restarted 34th as a result of the penalty. ● Harvick raced back up to the 20th position before returning to pit road for four tires and fuel on lap 33, but a pit-gun malfunction resulted in a loose wheel. The team returned to pit road under caution to tighten the wheel. ● The No. 4 team restarted 24th on lap 34 and raced up to the top-15 by the following caution on lap 40. ● Harvick came to pit road for four tires and fuel and gave the team a chance to clean debris off the grill on lap 42. ● The Jimmy John’s Ford restarted 20th on lap 45 and raced up to 11th by the end of the stage. ● The team chose to stay out to gain track position at the conclusion of the stage. ● Started third and finished 21st. ● Harvick raced up to the second position on the restart to start the stage. ● The Jimmy John’s Ford driver stayed out under caution on lap 58 and kept the second position. ● The team stayed out during the following caution on lap 66 to take the lead. ● Harvick remained in the lead until pitting under green-flag conditions on lap 91. ● He raced up to 21st by the end of the second stage. ● Started fourth and finished fourth. ● The No. 4 Ford dropped to sixth at the start of the stage and was racing in that position on lap 129 when Harvick came to pit road under green-flag conditions for four tires and fuel. He rejoined the field in 14th. ● Harvick stayed out under caution on lap 145 to advance from sixth to the fourth position as several cars opted to pit. ● The Jimmy John’s driver restarted fourth on lap 147, but he reported a potential issue with his front-right tire and dropped to seventh. ● Harvick stayed out during the final caution in the seventh position and raced up to fourth before the checkered-flag. ● Harvick qualified for the playoffs by virtue of his seven victories in 2018. He won at Atlanta Motor Speedway, ISM Raceway near Phoenix, Dover (Del.) International Speedway, Kansas Motor Speedway in Kansas City, New Hampshire Motor Speedway and Michigan International Speedway in Brooklyn. The No. 4 team’s race win at Las Vegas Motor Speedway in March does not count toward its playoff qualification due to a post-race penalty. ● Harvick takes 50 points into the playoffs thanks to his six points-paying victories, 10 stage wins and a second-place finish in the regular-season standings. His stage wins came at Atlanta; Texas Motor Speedway; two at Dover in May; Pocono (Pa.) Raceway in June; Michigan in June; Chicagoland Speedway; Pocono in August; and two at Michigan in August. ● This is Harvick’s ninth consecutive playoff appearance and his 12th overall. He won the championship in 2014. ● This was Harvick’s series-best 19th top-five and 22nd top-10 finish of 2018. 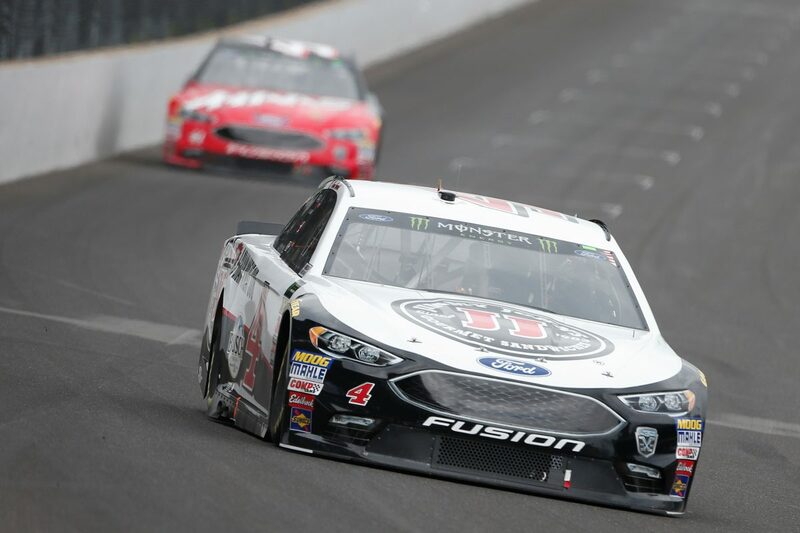 ● Harvick earned his sixth top-five and 12th top-10 finish in 18 career Monster Energy NASCAR Cup Series starts at Indianapolis. ● Harvick led once for 22 laps to increase his laps-led total at Indianapolis to 203. The day almost started disastrous, but you recovered and led some laps. You and Kyle Busch are at the top. What is the strategy for the final 10 races? You have a big points cushion to start the playoffs, but will you set a tone of winning races and not concentrate on that advantage with your guys? Do you like where you’re sitting right now and how you’re setup for the playoffs?